Line a cookie sheet with foil and place a rack on top. Spray rack. Put Chicken Breasts between 2 pieces of plastic wrap (Even better, use an empty cereal bag!) and pound until ½ to ¾” thickness. Toss Breadcrumbs with ½ of the Cheese, Parsley, & Salt. Dip Chicken in Egg, then press firmly in to Bread Crumb Mixture on both sides and place on sprayed rack. Spray top of Chicken with Olive Oil or Cooking Spray. Bake at 400̊ for 20 minutes. Top with a spoonful of Cannizzaro Sauce, then mozzarella and sprinkle remaining Parmesan Cheese and bake for another 5 minutes, until cheese is melted. Plate Cooked Pasta with Sauce on top. 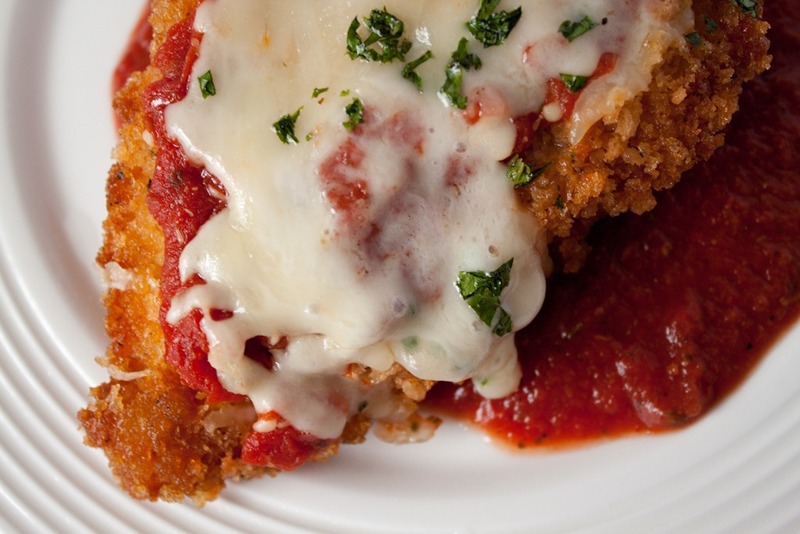 Top with your Chicken Parmesan!